Many young people may feel a calling to become successful business leaders, but few are chosen. Those who do make it may seem like far-off figureheads who were always different from us. But is that the case? Or are there things you can do to increase your odds of making it to the top? What were the things that CEOs did early on in their careers that set them apart? These were some of the questions I put forward in conversations with 20 global business leaders for the book “ Before I Was CEO ”. The answers I got were often un conventional wisdoms – a collection of unwritten and unspoken of rules that these business leaders followed throughout their lives and careers. I summarized a few of them below. It was a first curious observation. Many CEOs I spoke to had spent the first years of their careers in countries that were far off anyone’s radar – far away also from the corporate headquarters of multinationals. Jean-Francois van Boxmeer, for example, now CEO of beer-maker Heineken, spent the first 10 years of his career in Gabon, Congo and Rwanda. Paul Bulcke, recently appointed Chairman of food giant Nestle, spent more than a decade in Latin America, in Peru and Chile. And Steve Davis, CEO of health-focused NGO PATH, spent his formative years traveling in and out of Deng Xiaoping’s China. Better, then, to take the first 10 years of your career to discover your interests, your talents, and your preferences. It is also a good time to work on your personal development. That could at first be being a team player, learning technical skills, or managing your own time or a project. And it certainly should include experience in a non-traditional environment, preferably abroad. In today’s world, Barry Salzberg, former CEO of Deloitte told me, gathering international experience is a quasi condition sine qua non to make it to the top at the end of your career. The second thing I noticed was that most successful leaders, whether they were men or women, from America or from elsewhere, had a solid relationship and a stable family background. In the example above, all three CEOs had been with their respective partners since at least their early twenties. That turned out not be a coincidence. It was a pattern that indicated correlation. “My wife was there all along the way,” Paul Bulcke said, “she was a major factor in my success.” He didn’t only say that – I saw it, as his wife remained in touch after the interviews we conducted, and the couple often travelled together to events. 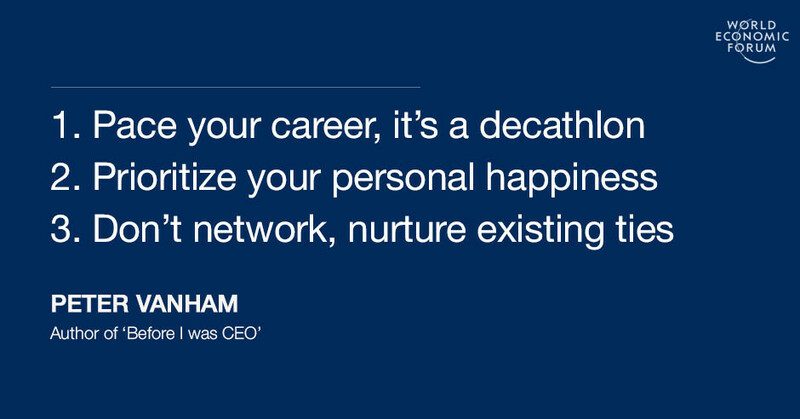 The same was true for the women CEOs I talked to. Susan Cameron, CEO of tobacco giant Reynolds American, told me how her career only went on a stable upward path after she met her husband. Orit Gadiesh, Chairman of consulting firm Bain & Company, met her husband, an Oxford graduate and adventurer, when both were young consultants at Bain . It was perhaps the most surprising and unsurprising finding at the same time. Surprising, because the image you might often get from a CEO is that he or she works 24/7, and prioritizes work above all else. But it was unsurprising, because we probably all have experienced that when something in our personal lives is not going well, work often doesn’t go well either. That doesn’t imply these CEOs don’t work very hard - but they do understand that personal happiness and professional success go hand in hand. And between the two the former is more important to get right than the other. The most persistent wrong advice young professionals get may well be to engage in networking , of the kind you do at cocktail receptions after work. There is no point in pursuing such loose, high-volume connections. CEOs profiled in “Before I Was CEO” engage much more actively in intense, focused networking in those groups they’ve been part of since their youth. The strongest of such networks are often based on religion, college or university affiliation, or nationality. I discovered that myself: the first interview I got was with Paul Bulcke, the CEO of Nestle, who is Belgian and had been part of the same student organization as me. Several other interviews also came about because of my active participation in the network of Belgians abroad. More importantly, the CEOs themselves pointed to the role of their strong relations, which they purposefully fostered. Patrick De Maeseneire at one point in his career got to know Klaus Jacobs, a German entrepreneur who later became an investor. Patrick’s ascent to the top of chocolate maker Barry Callebaut and human resources company Adecco hinged on the personal bond he built with Jacobs, who either founded or owned both companies. The adage goes: “If you want to go fast, go alone, if you want to go far, go together”. That’s true especially in building a career. But the experience of the CEOs I interviewed adds an extra layer to that: you are the company you keep. Let it be good company, whether in family or professional relations. Before I was CEO is now available in the US, and is out on November 30 in Europe and Asia.